David is a student at Grove Hills, seen briefly in "Gifted". He used to be friends with Lara, Cassidy, and Graham, but his social standing collapsed after he "only" got into the 90th percentile on his SAT scores. His fellow students abruptly decided he was boring, banal, and an idiot, with Graham and Lara disgusted to see he dares show his face at the school's open day. Unsurprisingly, David looks a bit fed up with things. He is not to be confused with David Sorenson, though coincidentally they are both intelligent characters who only appear in one episode each. 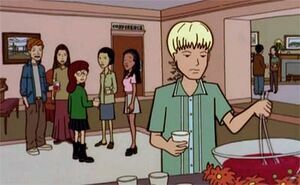 In Shiva's "Losers No More", David Bentley reconnects with Graham after the later has an epiphany, then transfer to Lawndale High as part of an attempt to improve themselves as people. This page was last edited on 24 April 2018, at 13:39.